There was a snapshot in Sunday’s Nebraska-Maryland matinee that seemed to be a pretty indicative reflection of the whole. Maryland’s Brianna Fraser sank a midrange jumper to put the Terrapins up eight with 4 minutes to play in the third. On the ensuing inbounds play for the Huskers, Nebraska almost didn’t get the ball in on time, almost turned it over in the backcourt, almost didn’t get the ball past the timeline and still ended up with a hoop at the bucket. Maryland answered with five straight. The Huskers (17-7, 8-3 Big Ten) were never out of things on Super Bowl Sunday in front of a near-packed house, but they never got within fewer than six points in the second half. Almost there against the top team the Big Ten has to offer in Maryland (20-3, 9-1 Big Ten) but not quite. Eventually, the Huskers fell 64-57 to the Terps, halting the Big Red winning streak at five games. “This one hurts a bit,” senior Jasmine Cincore said. If only because the Huskers hung with the 11th-ranked Terrapins, held them to 23.5 percent shooting in the game’s final frame and still left with the loss. Six different times in the second half Maryland stretched its lead to double digits and every single time the Huskers fought back and whittled it down. “I’m proud of the fact we competed for 40 minutes but we’re disappointed with this loss on our home court,” head coach Amy Williams said. Each time Maryland tried to throw a knockout punch, the Huskers had a counter, but time and again, Maryland had another. Nebraska didn’t shoot it well — the Huskers finished at 36 percent for the game — and Williams felt like a good portion of their looks early were uncharacteristic and forced. Guards Hannah Whitish and Nicea Eliely and forward Maddie Simon all struggled with their shots — combined 5-of-24 — but if you wanted to boil the loss down to a singular factor, Williams wouldn’t look at the shooting percentage. The biggest culprit of a 49-29 Maryland advantage on the glass was sophomore guard Kaila Charles. Charles played the entire afternoon and finished her day with 25 points and 16 boards (seven of them offensive). Cincore was visibly disappointed after the game and wasn’t about to mince words. “That’s the name of the game right there,” she said. If there was a bright spot, it was in freshman Taylor Kissinger’s play. The sharpshooter was 4-for-4 at halftime and finished the game with 18 points to lead the Huskers. Maryland head coach Brenda Frese wasn’t overly concerned about the performance, noting that the Terps did their job of slowing the Nebraska starters, who combined to shoot 12-of-39. Williams said she was pleased with Kissinger’s play but was more concerned with correcting the negatives. She was asked about last year’s team and whether or not this one felt different; the last time Maryland came to Pinnacle Bank Arena, they left with a 93-49 victory. Williams didn’t want to play the comparisons game. 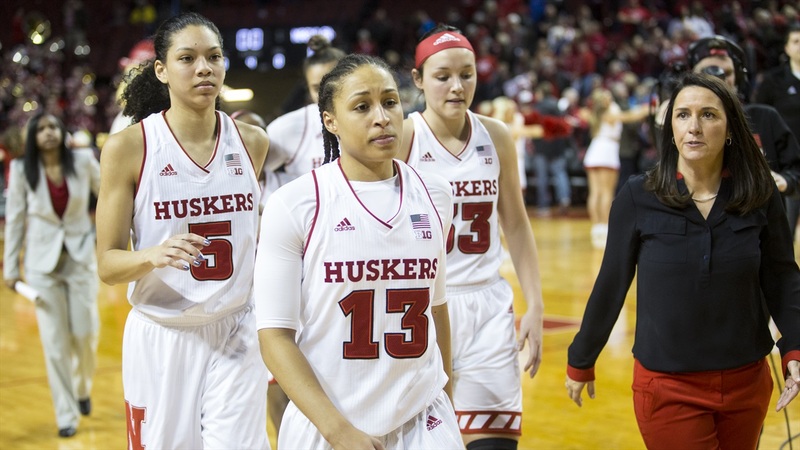 The Huskers are off for a week before hosting Wisconsin on Feb. 11.